Photo by Helena Coll @ Noiselets 2017, Barcelona (Spain). “Live coding with crowdsourced sounds & a drum machine”. International Conference on Live Coding 2019. Closing Concert at the Public School of Music and Dance María Dolores Pradera, Madrid, Spain. January 18, 2019. 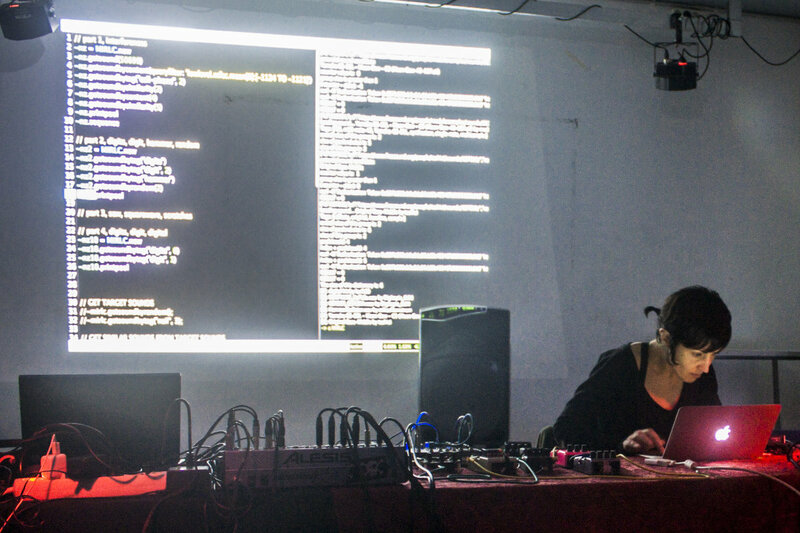 “A session on participatory mobile music and live coding using crowdsourced sounds”. NTNU Research Concert. Dokkhuset. Trondheim, Norway. November 24, 2018. Music Performance of Imaginary Berlin @ WAC 2018. Factory Berlin, Berlin, Germany. September 19, 2018. Music Performance of MareNostrum @ Cube Fest 2018. Cube Fest 2018, Moss Arts Center, Blacksburg, VA, USA. August 9, 2018. Live coding with EarSketch @ WiSWoS 2016. Women in Sound Women on Sound 2016: Educating girls in sound. Jack Hylton Music Room, University of Lancaster. Lancaster, UK. April 22, 2016. Live set @ WiSWoS 2016. Women in Sound Women on Sound 2016: Educating girls in sound. Jack Hylton Music Room, University of Lancaster. Lancaster, UK. April 22, 2016. Live coding @ PHONOS 2013. Perspectives on multichannel live coding. PHONOS. Sala Polivalent, UPF. Barcelona. October 4, 2013. Live set @ Niu 2012. Crispy Crunchy Creaky. Niu. Barcelona. September 20, 2012. Live set @ 5a Mostra Sonora i Visual 2006. 5a Mostra Sonora i Visual. Convent Sant Agustí. Barcelona. June 10, 2006.